4ft (1.22m) x 15mtr welded wire mesh roll with a 1"x1" inch square mesh hole. 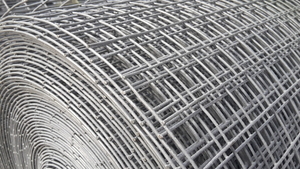 Made from 1.6mm thick wire (16 swg gauge), this strong galvanised steel mesh is ideal for many fencing, pet and garden protection applications. With a square mesh aperture of 25mm x 25mm, the galvanised weld mesh fencing can be used to as an attractive garden fence to protect from rabbits, hare, Muntjac, foxes and neighbours dogs. It can also be used for garden boundary fences, dog fences, cat enclosures and aviaries. Extra thick 16 swg steel wire 1.6mm dia. This product is galvanised by hot-dipping the welded steel mesh in zinc, which provides a rust and corrosion resistant protection ensuring the steel fencing is suitable for many years used outside without maintenance.